For the tournament, we're calling Applebee's franchises in different cities across the country immediately after the local institution has completed its game, win or lose. We'll pretend to be oblivious about what just happened in order to get a detailed game description from someone in the restaurant. 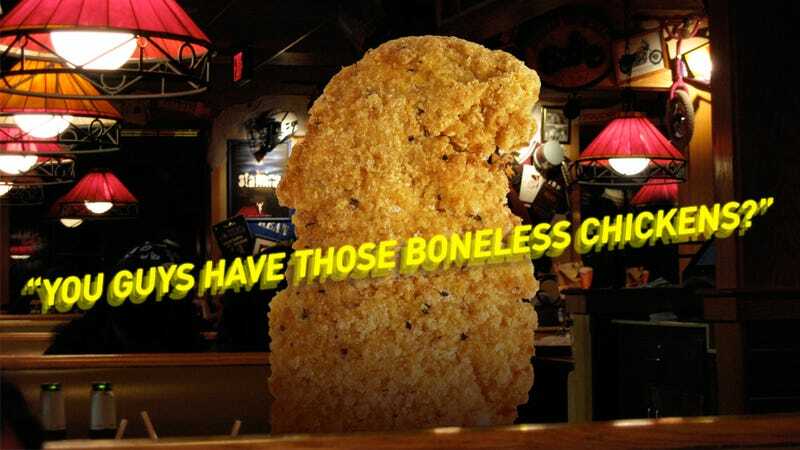 At the end of every call, we'll also ask for "those boneless chickens." We'll be met with friendliness (everywhere) and confusion (no, it is not called "Florida Coast Guard University"). We promise it will be a delightful practice in modern American communication and neighborliness. Today, we continue with calls from the round of 64. Enjoy. "They didn't score as many points as the other team." "Nope, nope, it was pretty bad, actually." "Hey, does anybody know what the score of the game was?" "Oh, I had them going to the Selective Six. That's too bad." "I have some bad news…"
"They weren't able to shoot very good free throws." "Not to burst your bubble, I'm just sayin'." "We won by big. Like 20 points." "Yep, uh, Florida Coast Guard, or something like that." "I'm not a Duke fan, so they look crappy to me all the time." "My other botanist friends are gonna be upset with me; I told them it was at 4:00." Note: We called a local Applebee's for every team, but we've selected the most entertaining reports here. More to come for the Sweet Sixteen.